Made with a lemon cake mix, heart-shaped layers are split, filled with coconut pudding and decorated with pink-tinted whipped topping and coconut. Preheat oven to 350°F. 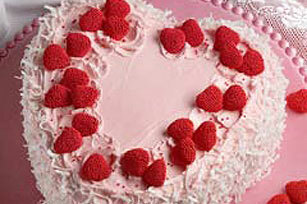 Prepare cake batter as directed on package; pour evenly into 2 greased and floured 9-inch heart-shaped layer pans. Bake 40 minutes or until toothpick inserted in centers comes out clean. Cool completely. Meanwhile, prepare pudding mix as directed on package for pudding except using only 1-3/4 cups milk; cool. Refrigerate until ready to use. Stir until smooth and creamy. Split each cooled cake layer in half horizontally, making a total of 4 layers. Spread each of 3 layers with about 2/3 cup of the pudding; stack layers. Cover with remaining cake layer. Prepare whipped topping mix as directed on package; tint pink with a few drops food coloring. Spread on top and side of cake; sprinkle coconut around edge of top and on side of cake. Refrigerate until ready to serve. Top with raspberries just before serving. Store leftover cake in refrigerator. This coconut cake makes a great treat to share with friends and family. Prepare as directed, using yellow cake mix.